Cherries require harvesting at full maturity since the fruits won't ripen further after they are picked. Most of the cherries on a single tree reach optimum maturity near the same time. A single fruit provides a guide for picking the rest of the cherries, though you can leave those that haven't fully developed their color on the tree for a few days after the initial harvest to further ripen. Check your cherries regularly as the fruit forms to ensure you are ready to pick the fruits as soon as they are ready. Cherries form in clusters on the tree in early to midsummer. Inspect the fruit daily for maturity once it begins developing its full color. The color of mature cherries depends on the variety grown, with some varieties, like Bing, maturing to deep red-black and others, like Rainier, developing a red blush on a yellow background. Squeeze a full-colored cherry gently between your thumb and forefinger. Mature cherries feel firm and the skin only gives slightly under gentle pressure. Grasp the cherry stem below its connection to the branch. Lift the stem up, separating the cherries from the branch. 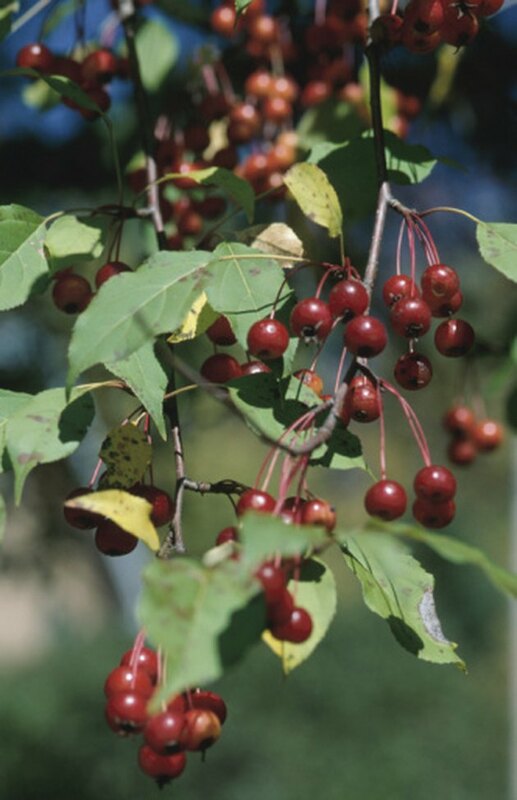 Sour cherry varieties separate from the tree with no pulling once mature, but sweet varieties may require a gentle tug. Taste the harvested cherry. The fruit has reached optimum ripeness when the cherry is juicy, yet firm, and has developed its full flavor.